OTC medicine is more powerful than you realize. If you’ve ever suffered from a headache, sprained a muscle, or had a fever, then the chances are that you’ve taken an over-the-counter pain killer like acetaminophen or ibuprofen. Both treat the same symptoms and have been around for years, but did you know that each has its own set of strengths and weaknesses? According to the experts, sometimes it’s better to take one over the other. The first forms of acetaminophen were synthesized in 1873, however, it wasn’t until 1955 that it became widely used in the United States under the name Tylenol. To this day, it remains a popular way to treat minor aches and pains, but are we using it correctly? Well, it’s always best practice to ask your doctor, but keep in mind that acetaminophen (known as paracetamol in other parts of the world) is not part of the class of drugs known as nonsteroidal anti-inflammatory, or NSAIDs. That means acetaminophen isn’t as good at treating injuries such as a sprained ankles, arthritis, or any other pain associated with inflammation. Although it can offer fever relief and headache relief, and unlike other NSAIDs, is less likely to damage the stomach lining. The drug is also primarily metabolized in the liver, meaning it is a better option for those who suffer from kidney disease, and it also means that it shouldn’t be regularly consumed with alcohol or other drugs. Ask your doctor about taking acetaminophen with other drugs, and keep an eye on cold medicines as they’ll often contain the drug. Taking too much, or more than the recommended amount can cause serious liver damage or worse. First discovered in 1961, ibuprofen is on the World Health Organization’s List of Essential Medicines and is a common way to treat mild to moderate pain. 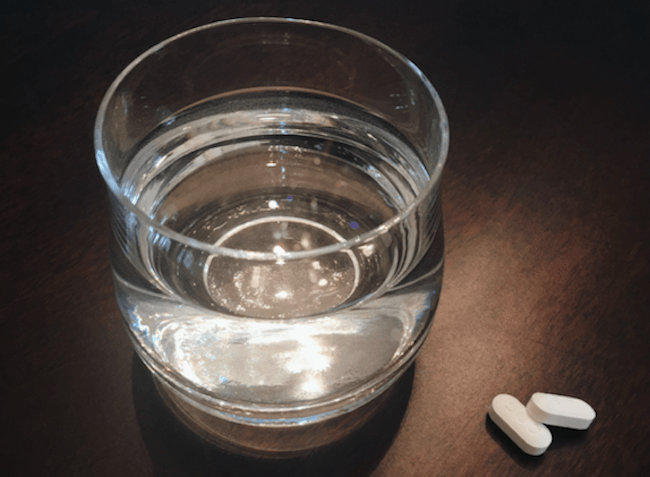 Because of its anti-inflammatory nature, ibuprofen tends to work a little better in most cases, in general — including pain as a result of injury or surgery. It’s also quite a bit easier on your liver, however, it is harder on your kidneys and your stomach, and prolonged use can have adverse effects on your heart. So it’s not recommended if you suffer from diseases that affect the kidneys or the heart. Again, follow all recommended dosages, don’t mix with other drugs unless told by a doctor or a pharmacist, take with food, and ask your doctor which is right for you in your specific situation. Need more wellness tips? If you've been unsuccessfully trying to lose weight in 2019, here's some advice.